Whoever said that clean jokes can’t be funny couldn’t be more wrong. And if you think so, we can prove you wrong, because we’ve made a compilation of family-friendly and yet funny jokes. These manage to walk that delicate line between jokes that stay on the right side of PG and ones that will actually make you laugh. Nevertheless, these jokes are healthy and good for both the young and old. Some of these jokes in our collection can teach you things, as well as make you laugh. Share with anyone, anytime, and anywhere without fear of insulting someone unknowingly. Enjoy our collection, we hope you’ll find them as funny as we do! Because pepper makes them sneeze. 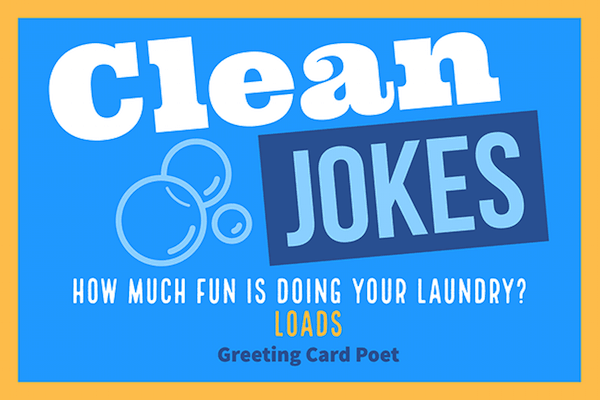 How much fun is doing your laundry? Why did the gymnast put extra salt on her food? So she could do summer salts. What’s purple and 5,000 miles long? The Grape Wall of China. What kind of sandwiches can you make at the beach? Peanut butter and jellyfish sandwiches. (Check out the history of the peanut butter and jelly sandwich). I’ve decided I need to quit my job as a personal trainer because I’m not big enough or strong enough. I’ve just handed in my too weak notice. Did you hear about the pessimist who hates German sausage? He always fears the Wurst. 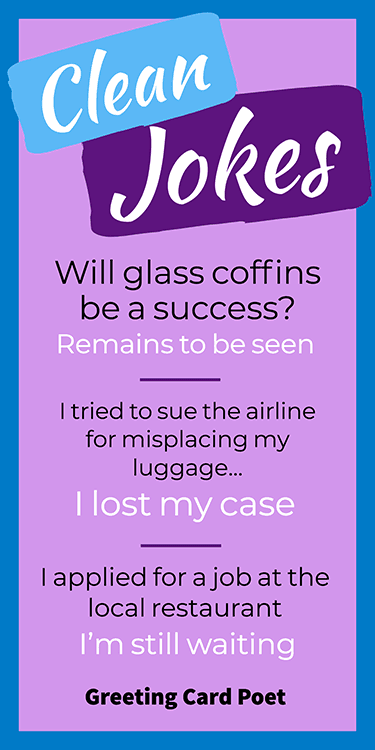 I tried to sue the airline for misplacing my luggage…I lost my case. What do you call a girl with an hourglass figure? Where did Noah keep his bees? Tip: Our clean jokes can be read to kick off a business meeting, enrich a teacher’s class or to lighten the mood at a dinner party. What’s the best day of the week to go to the beach? I applied for a job at the local restaurant. Did you hear about those new reversible jackets? I’m excited to see how they turn out. My friend’s bakery burned down last night. Now his business is toast. What do you get if you cross a snake and a lego set? I can hear music coming out of my printer. I think the paper’s jammin’ again. Do I like wind turbines? Yes, I’m a big fan. Where do polar bears vote? What does the dentist of the year get? Why did the bee go to the doctor? What do you get if you cross a centipede and a parrot? What do you get when you cross and smurf and a cow. Why is England the wettest country? Because the queen has reigned there for years. What do you get when you cross Sonic The Hedgehog and Curious George? What do you call two elephants having a chat? What do you call leftover aliens? You might like our Halloween Humor, Jokes, Puns and Memes. Someone threw cheese at me. What did the judge say when the skunk walked into the courtroom? I’ve just written a song about tortillas. Actually, it’s more of a rap. What has one horn and gives milk. What kind of flower doesn’t sleep at night? Did you hear about the two bed bugs who met in the mattress? They got married in the spring. Why do watermelons have fancy weddings? What do you call purple when it is being mean? A new type of broom has come out. It is sweeping the nation. Who cleans the bottom of the ocean? What did one aspiring wig say to the other aspiring wig? I wanna get a head. Did you hear about the paddle sale at the boat store? It was quite an oar deal. Why did Goofy put a clock under his desk? Because he wanted to work over-time. What did the tailor think of her new job? Try our Cornball Humor on for size. I used to be a train driver but, I got sidetracked. When you dream in color, is it a pigment of your imagination? I’ve got a phobia of over-engineered buildings…it’s a complex complex complex. If Satan ever lost his hair, there would be hell toupee. My friend made a joke about a TV controller…it wasn’t remotely funny. Broken puppets for sale…no strings attached. Someone stole my mood ring. I’m not sure how I feel about that. I couldn’t work out how to fasten my seatbelt…then it clicked. Getting paid to sleep would be a dream job. I can’t believe I got fired from the calendar factory…all I did was take a day off. My fear of moving stairs is escalating. If you think of a better fish pun. Let minnow. I tried to catch some fog earlier. I mist. Change is hard. Have you ever tried to bend a coin? I wonder if earth makes fun of other planets for having no life. I’m going to stand outside. So if anyone asks, I am outstanding. I am going bananas. That’s what I say to my bananas before I leave the house. I’m so bright my mother calls me son. I have a speed bump phobia but I’m slowly getting over it. Why do wrappers need umbrellas? I don’t know, and I don’t care. What did one DNA strand say to the other? Does my bum look big in these genes? My friend recently got crushed by a pile of books, but he’s only got his shelf to blame. How do you make gold soup? How to bears keep cool? Why did the man put his money in the freezer? He wanted cold hard cash. Why are chefs so mean? They beat eggs and whip cream. Why did the man hate his job as an origami teacher? Did you hear about the hyena that swallowed an Oxo cube? He made a laughing stock of himself. Have you heard about corduroy pillows? You’re on our Clean Jokes page.